Nobody in the history of human-kind has done The Porch better than Pete and Joan. The Porch is what works best for humans. It’s where we are what we were meant to be. It can be embodied in many realities and settings. In the case of Pete and Joan, my first Golden Porch Award winners, the Porch was everywhere inside and outside their house. Yup, their house was one big fantastic PORCH. Over the years they created the coolest little piece of heaven you could ever want to visit. 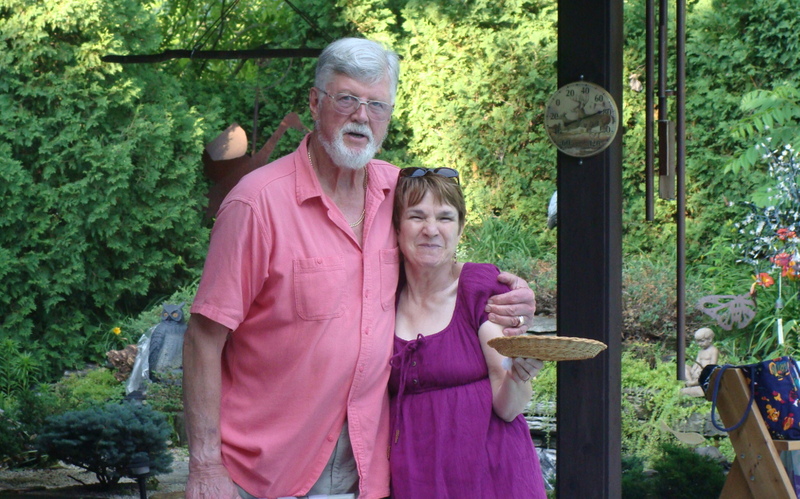 Of course, it is about the people and the time we shared, but with Pete and Joan, you can’t separate their love of, and generosity to, friends and neighbors, from the love they poured into their Porch world. And now that I’m writing this I wish I had taken a few more pictures. But hey, we were visiting. I never thought it would end. There would always be another time to get pictures. 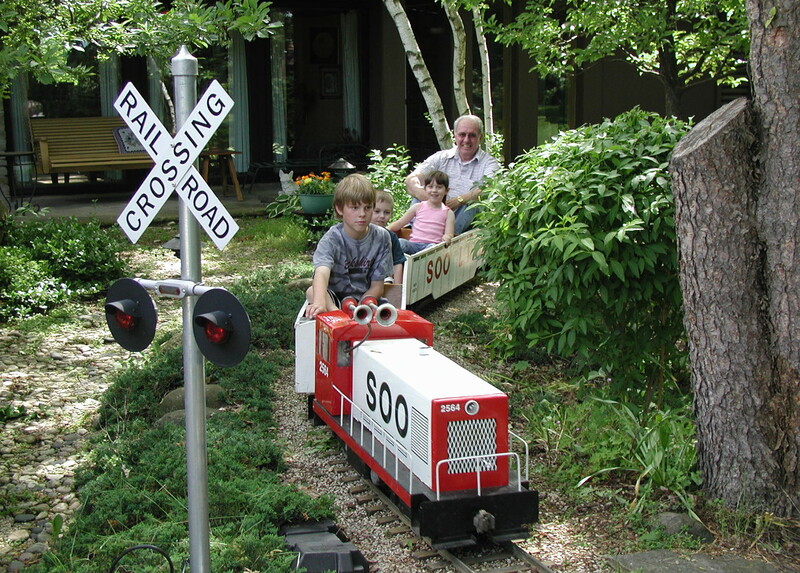 The front porch swing (behind the RR crossing sign and made by Pete) looks out on a yard filled with train tracks and a real train – REALLY! – over bridges and waterways, through the woods. 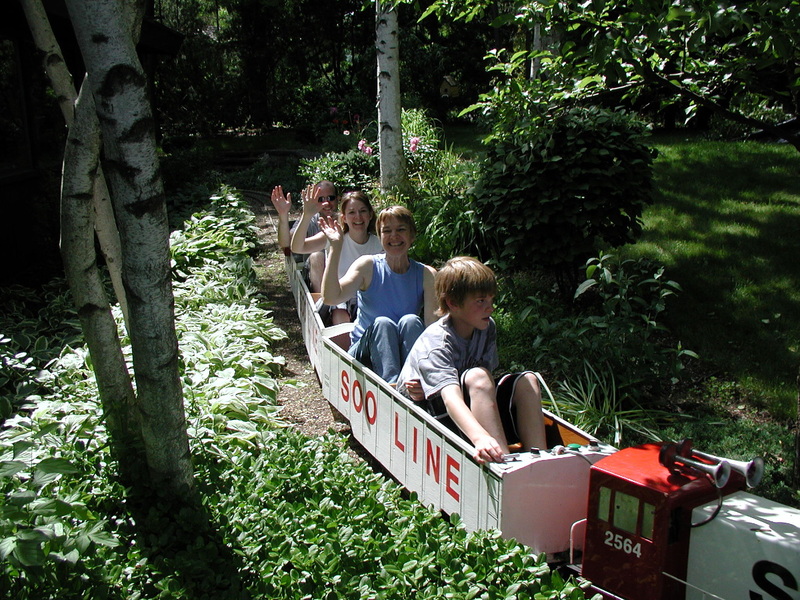 Several times a summer they gave rides to kids of all ages – people came from near and far…. Through the years they added neat stuff on top of neat stuff. 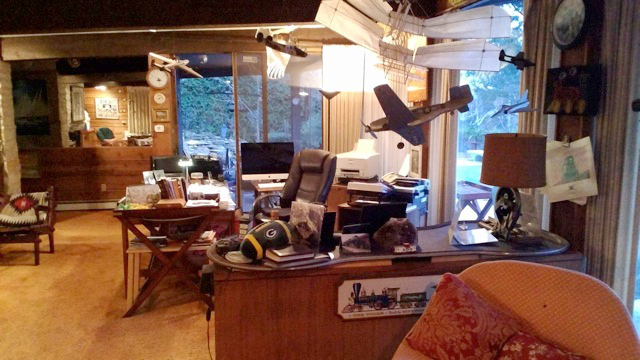 Everywhere you went, inside and out, was nothing but, “this place is so cool!” When you came in the front door you were greeted by Pete’s office which was decorated in every available space with his cool toys. Airplanes hung from the ceiling! Alas, I have no pictures of these toys. (Update: now I have a picture of the den – see further update below). 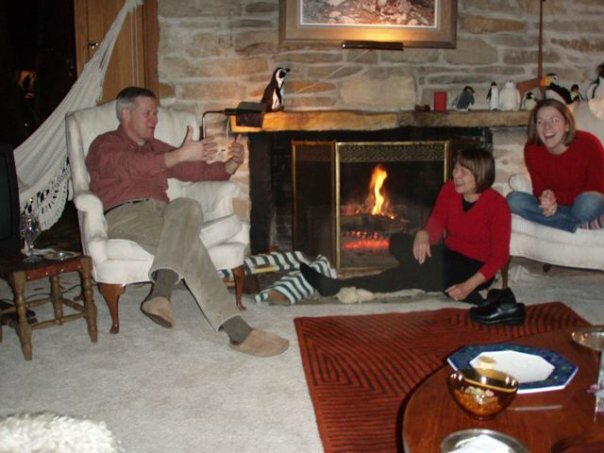 A fireplace was there with comfy rockers where I sat many a time to enjoy the company of Joan and Pete, family, and friends. Pete’s Den. No further comment necessary. Thank you Joan and daughter Deb for this picture. The fireplace is to the left. 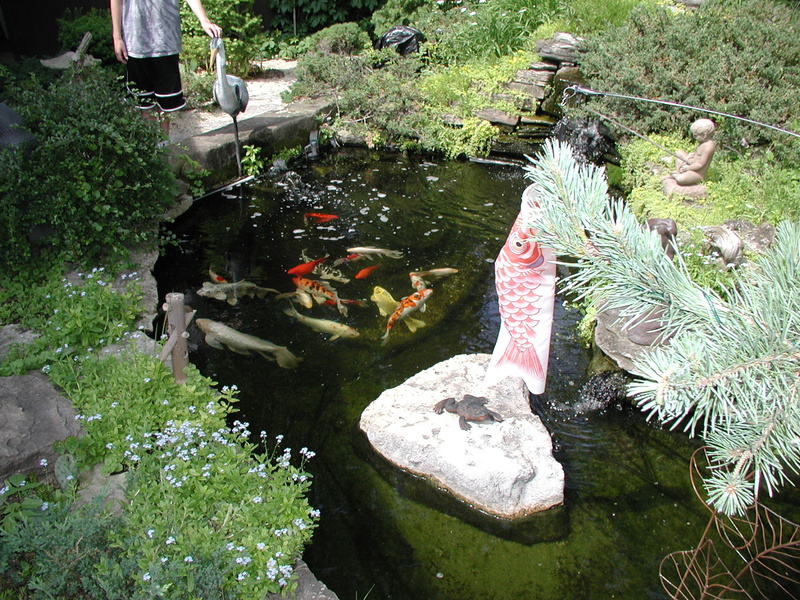 In the back there is a real fish pond with real live fish in it. and beautiful gardens, more toys, and objects of art. The outside Porch and patio area. There are all these cool wind-whurly things on the back deck and yard. It was even good when the wind blew. You can see a couple of them in the image below. Where did they get all those cool toys? It’s look like we’re eating, but we were really solving all the world’s problems – peacefully. I often helped Pete cook. Pete, as always, was gracious. 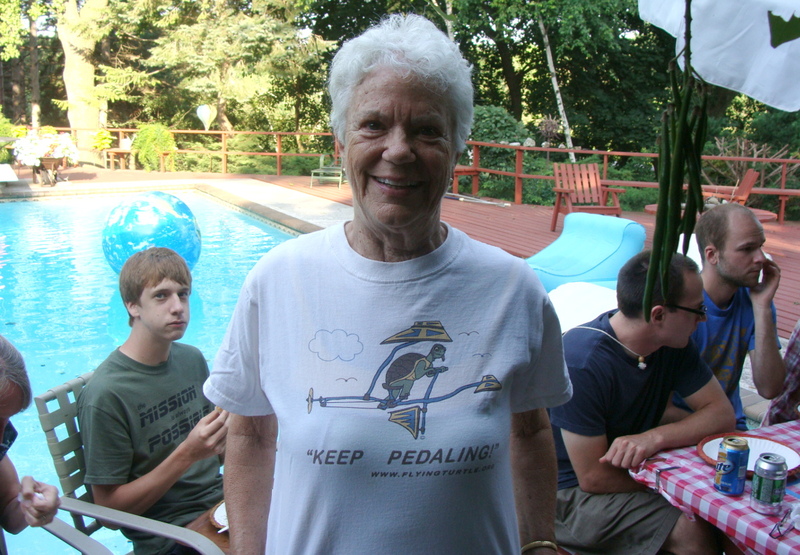 Only an amazingly gracious host would wear one of my website T-shirts to her party. Hugging is okay on the Porch. Even for those of us who are hugging impaired (which Pete was not). Other people (though not nearly enough) are fortunate enough to have such things. Desperadoes waiting for the train. There isn’t any better place to have nothing to do but wait for the train. To be Golden Porch award winners your Porch has to embody the human qualities that can make us better – tolerance, generosity, open-mindedness, neighborliness. 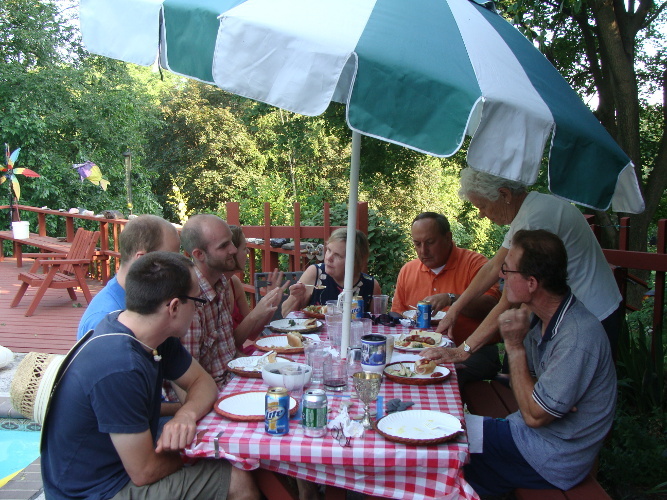 At Pete’s and Joan’s Porch we always felt unreservedly welcome. It is a place you can relax and love your neighbors – which I have on good authority is the same as loving God. We shared ideas and commiserated on all the things life brings. 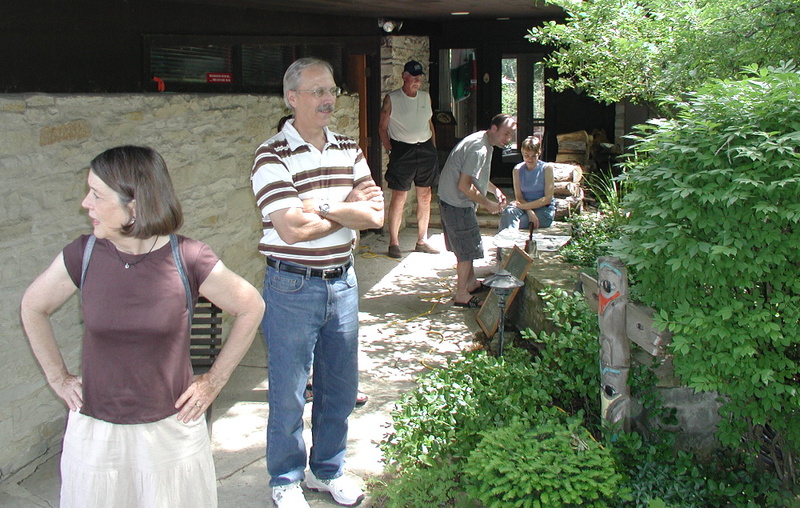 Even normally boring people become erudite and funny at Pete’s and Joan’s Porch. Can you believe it? We lived right next door to them. But before I got all the pictures, we had to move away. We’ve returned to their Porch as often as we could, and were welcomed each time. Likewise Joan and Pete came when they could to share our new Porch (five hundred miles away) – and do some fun train watching. In the winter the Porch works fine indoors. 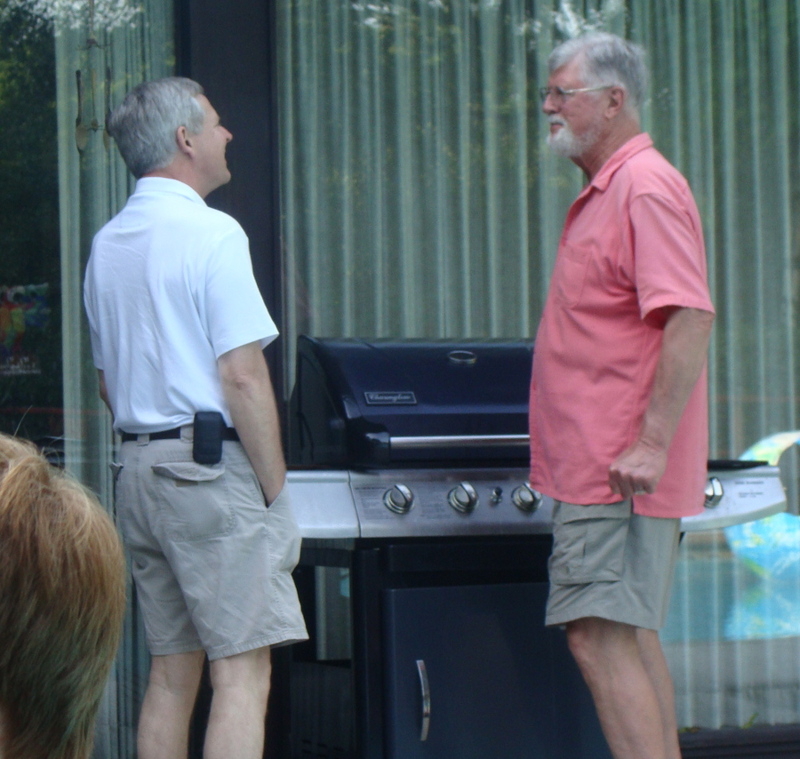 Pete with friend and neighbor Bill. We get to take what we learn with us. Thank you Pete. Thank you Joan. We got to live on your Porch, and learned a lot. And I got to ride on your train. This little page can’t begin to tell all I’d like to about Joan and Pete, and their full lives, but I wanted to mention their work with the Bilwaskarma Clinic. Young Pete and Joan went off to Nicaragua, fresh out of medical school, to help run the Bilwaskarma Clinic. They continued to keep active in helping to maintain the clinic until fairly recently – even they’ve been slowed by age. The clinic was destroyed by the Contra War during the 80’s, and remained abandoned ruins until resurrected in the 90’s, which they, of course, helped with. Here is another link, in addition to the one above, for information about the Bilwaskarma Clinic. See instructions below on how to donate. Update 11 Nov 2014: I started this little blog on Porch Sitting to experiment with and learn a little about WordPress, before going on, I presumed, to bigger and better blogs. 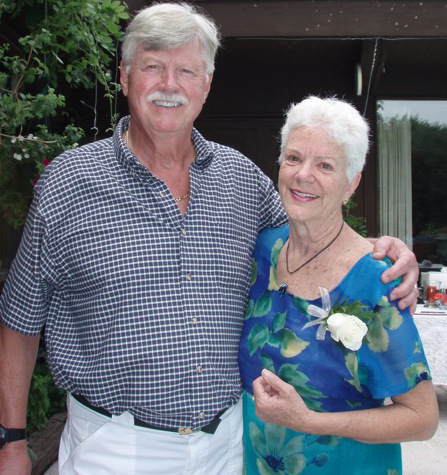 Shortly after making this page for Pete and Joan, I learned that my friend Pete had passed away September 27, 2014. In October a service was held to celebrate his life. His children, brothers, and many friends spoke. 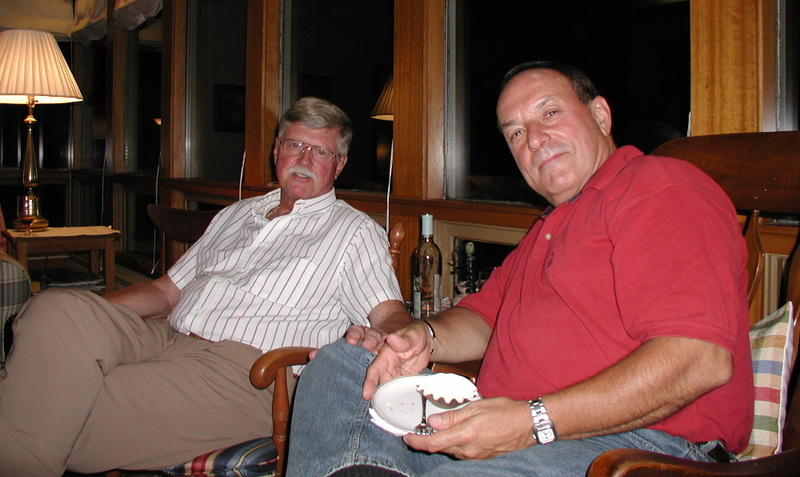 I learned a lot from Peter during the relatively short time in both our lives that he and I were friends. At the memorial service I continued to learn. As his family and friends spoke, I learned that I did not know very much about Pete’s life. He had an amazing busy life, full of impressive accomplishments, yet during all those many Saturday mornings we had breakfast together and numerous other times together, he somehow over and over kept not talking about himself. Looking back I talked plenty about myself. That was Pete. We talked ideas, politics, religion, and he made me think I was just about the most interesting person he’d ever met. I learned during his life celebration that I wasn’t the only one. It was one of his many gifts. When Pete and Joan were visiting us in our new home in Erie, PA, Pete would get up early and walk the hundred yards or so from our house to a bench over looking Lake Erie. There he would smoke a cigar and write a poem or bit of prose considering something simple or profound. Then he came back and without fanfare briefly shared it with us. Thanks Pete. So this blog is officially dedicated to the memory of Pete. It seems perfect and somehow ordained. Pete knew how to use a porch. I promise that when you (dear reader) visit my porch I will try to talk less about myself and learn what I can about you. That won’t be easy for me because I’m so darned interested in myself. I will use Pete’s memory to help me improve this skill. 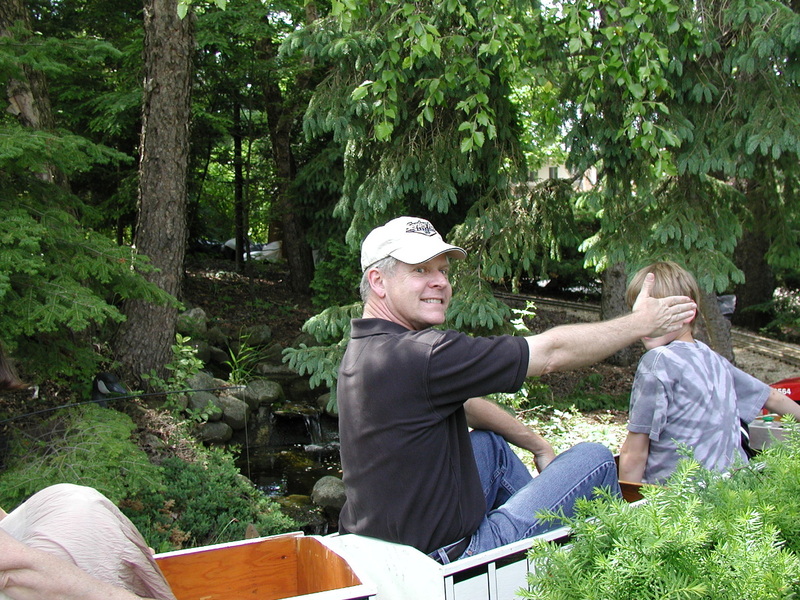 Here is a link to his obituary: Pete Haupert Obituary ; Pete would say, “Forget about me. Just skip to the stuff on the Bilwaskarma Clinic and make a donation!” The relevant excerpt is shown below. Note: In Memory of A.P. Haupert — Bilwaskarma Outreach Account). Mail to: Board of World Missions, Box 1245, Bethlehem, PA 18016. These donations will support the mission in Nicaragua, which he has faithfully supported since 1968 both financially and with his time and skills. After returning to Wisconsin with his family, Dr. Haupert continued to return annually to Bilwaskarma, Nicaragua, performing surgeries needed by the indigenous people of the area and in later years as a consultant. 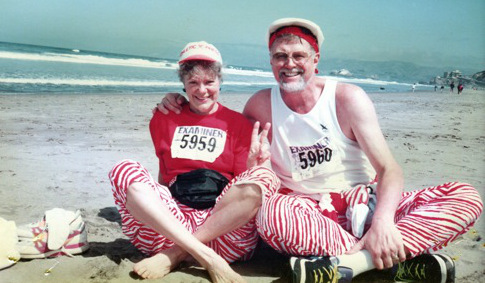 Joan and Pete – married for 55 years. I remember those times. I remember that porch. It was as the article says. A magic in the mist, a joy in the glen. Your perspective shifted–it seemed at least sometimes possible for fun and goodness to be the same thing. Those were the best of times! Our family and good friends making memories! You, Andy and Margaret have already said it well. I am blessed to live just a five minute walk from Pete and Joan’s. I was just there yesterday. Lucky me ~ Joan, her daughter Debbie and Martin carry are keeping the porch open. Miss you Pete!